Blume's Blog: Deflationgate: The Story Goes On . . .
Belichick denies any knowledge of deflated footballs. He privately asserts that he knows more about football than God but individual footballs do not merit his attention. He cares nothing for their fate. He doesn't touch them and prefers not even to think about them. He's a sensitive guy underneath it all and the very shape of a football makes him a bit queasy. So when it comes to deflating footballs, he couldn't be more innocent. Really? First of all, if Belichick is innocent then there is no such thing as guilt, the very notion is outmoded. As for me, I believe he sanded, scraped and for good measure bullwhipped all twelve of those Patriot balls. He kept the lights on all night in the football locker, just so the balls couldn't sleep. He brought in Rottweilers to snarl, bark and slobber at the defenseless (also offenseless) balls. The he played Der Ring des Nibelungen really loud. 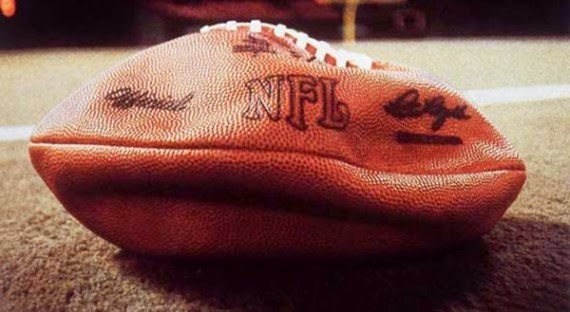 Between the dogs and the Wagner most footballs were deflated. Eleven out of twelve tortured balls deflated nicely. The heroic exception is being flown to Guantanamo for special treatment. If there are drone strikes on February 1 at University of Phoenix Stadium that just happen to wipe out most of the Seahawk secondary, well he won't be responsible for that either, will he? don't listen to him. the other topic round her is boston olympics which is a waste of airtime . . .